I finally found the photo I wanted for 'confined'. Yes, yikes is pretty much accurate. I'm happy that I now work from home. That looks a lot like where I work, before all the walls came down. 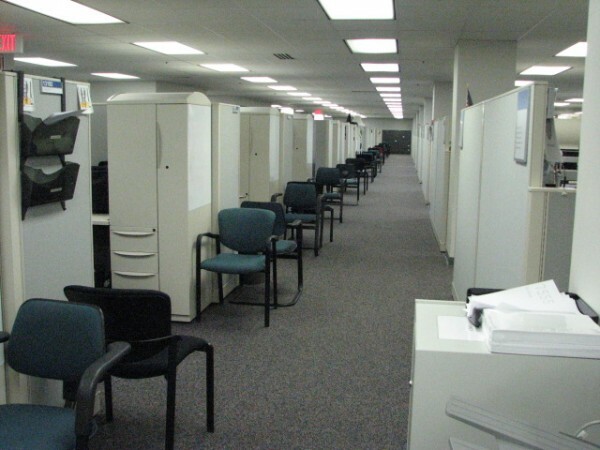 Now our 'cube farm' is wall-less, and more noisy than ever. I always feel so closed in while I was there and at the same time, I felt like everyone was watching me. It was just odd. And we have both found ways to escape which is good. Oh my - I don't think I would like to work there - it would feel both too confined and too public! That is exactly how it feels! I hated it. There were people there that decorated their cubes which made them seem even smaller. I brought nothing from home save a coffee mug. It didn't feel like there was room. Now, I am lucky enough to work from home and it's a big relief. How depressing! I'm glad I never worked in a place like this - too anonymous. It was dreadful. It was that the job was dreadful, but it was all of the cubes and the noise and everyone talking at once while you tried to work. It's an insane way to do business. Now, I work from home. I'm doing the same job but I'm in my house! It's perfect and it makes all the difference in the world. That really sounds and looks confined! The only times I had to work with so many people in one large room had been research work for my theses in big libraries, where it's mostly silent. I can't imagine how difficult it must be to concentrate when people are talking all the time. Why are the chairs standing in the corridor? The chairs are just outside each cube because inside the cube, you only have room for your chair. If anyone needs to see you about something, they have to pull the chairs you see in this photo around the side and more or less sit in the doorway to the cube.